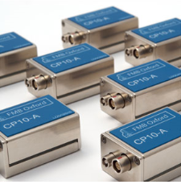 FMB Oxford Scintillation Detectors come in two sizes and various configurations that are tailored to meet your individual needs, whether that is an individual detector or an array for a Multi Crystal analyser. The Scintillation Detector is made up of 4 components; a scintillation detector head, pre-amplifier electronics (CP), signal cable and Pulse Processing electronics (C400). The system comes with software for installation on a Windows PC and command protocols for LabView and EPICS database and GUIs. In the detector head is a scintillation crystal, which absorbs X-rays and produces visible photons. The crystal is optically coupled to a photomultiplier tube which converts the light into an electronic signal; the amplitude of which is dependent on the incident X-ray intensity. The signal is then pre-amplified by the CP-10A before being transferred to the C400 for pulse processing. FMB Oxford offer a range of scintillation crystals and thicknesses. Your individual choice is a balance between count rate and energy resolution. The highest performing crystal in FMB Oxford’s range is the Lanthanum Bromide with a decay time of 16 ns. It can register faster photon rates and output a greater light signal per photon than any other crystal type.